Host a colorful and fun rainbow theme birthday party celebration with the ideas featured on this page. 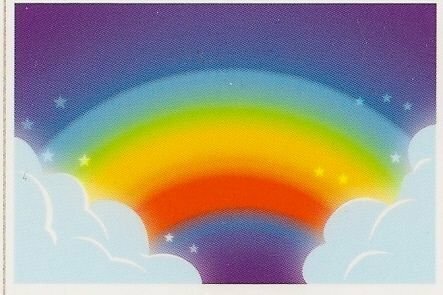 When I came across the Rainbow Wishes party supplies featured on this page I immediately fell in love. The colors are so beautiful and vibrant. Any girl would love this theme to celebrate their special day. In addition to these amazing party supplies, I found a large selection of other rainbow party items you can incorporate into you celebration such as custom party favor stickers, cupcake toppers, cake supplies, unique party favors and decorations. For your party, you can purchase dinner plates, dessert plates, balloons, tablecovers, cups, napkins, party hats, premade party favor boxes, pinatas, table centerpieces, cupcake wrappers, wall decal decorations, placemats and a personalized birthday banner. Personalized favor tags always look great on party favor bags or boxes. 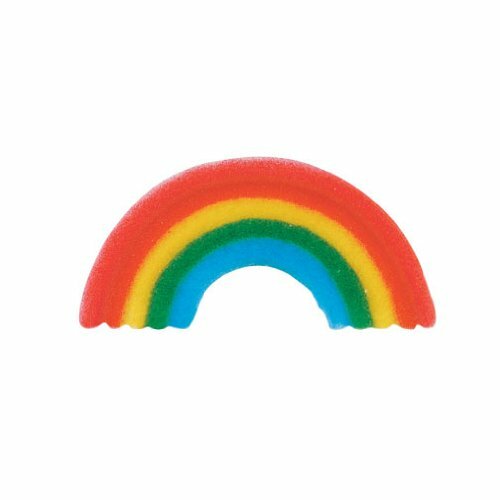 The Rainbow Party Favor Sticker pictured here would be a wonderful choice for your favors. It also coordinates with one of the invitations featured above. If you are handing out party favor bags, you could matte the sticker on cardstock and punch out. Then punch a hole on top, insert ribbon or string and attach to your favor bags. If you are handing out favor boxes, you can place the custom sticker directly onto the box. Other rainbow favor stickers include colorful hearts, polka dots and birthday balloons. There are fun rainbow cakes you can make. The first is the cake pictured here. This cake is made by tinting your cake batter rainbow colors, baking and then stacking. How to make a rainbow cake. Another is a tie dye rainbow cake. With this cake you tint the batter different colors and then layer the batter into your cake pan. The finished cake has a colorful rainbow tie dye look. You can also use this technique to make rainbow cupcakes. How to make a rainbow tie dye cake. Some of the rainbow cake and cupcake supplies on the market include sugar decorations and edible cake toppers. You can bake and decorate your cupcakes with white frosting. Then top each cupcake with one of the colorful sugar decorations featured below. Edible cake toppers also make a fun and easy cake decoration. Simply bake and frost your cake and then apply the edible cake image. There are two images featured below to choose from. This polka dot rainbow cupcake wrapper would be super sweet for your party treats. These wrappers feature high quality, full color printing. Simply wrap around your frosted cupcakes and attach with double-sided tape. The personalized cake toppers pictured below would also make a great addition to your birthday cake. Toppers are made from 100% food safe acrylic and measure 4" in diameter. Chocolate always makes a wonderful party favor. 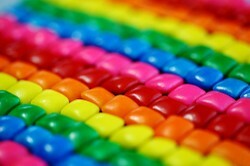 You could use these specialty rainbow candy molds to make super sweet favors for your celebration. Rainbow Twizzlers would make amazing party favors. You could cut the candy up into smaller pieces and place them into FDA approved bags. Then tie with the rainbow ribbon featured below and attach a custom rainbow favor tag like the one I included above. I love this rainbow twirl pops! Simply attach a few of the pops in a bouquet style, tie with curling ribbon and attach a custom thank you card. They kids will love them. If you are looking for bags for your favors, these would be perfect! Fill them up and attach a thank you tag. These colorful bags will look wonderful on your party favor table. Rainbow ribbon designed ribbon would be a great way to embellish your party favor bags and/or boxes. 24 individually wrapped swirl pops. Each 1 3/4" cherry-flavored square pop is on a 4" plastic stick. This should be a simple party to find enough supplies to throw.